Pumpkin spice everything has taken over coffee shops and store shelves. Near triple-digit temps have been usurped by cool breezes and windows-down weather. And while somewhere retail employees are probably unboxing Christmas ornaments–it’s fall in the Carolinas. For hikers, this is prime time. The big dance. The time to clear weekend schedules, check leaf change reports, and head to the trails. 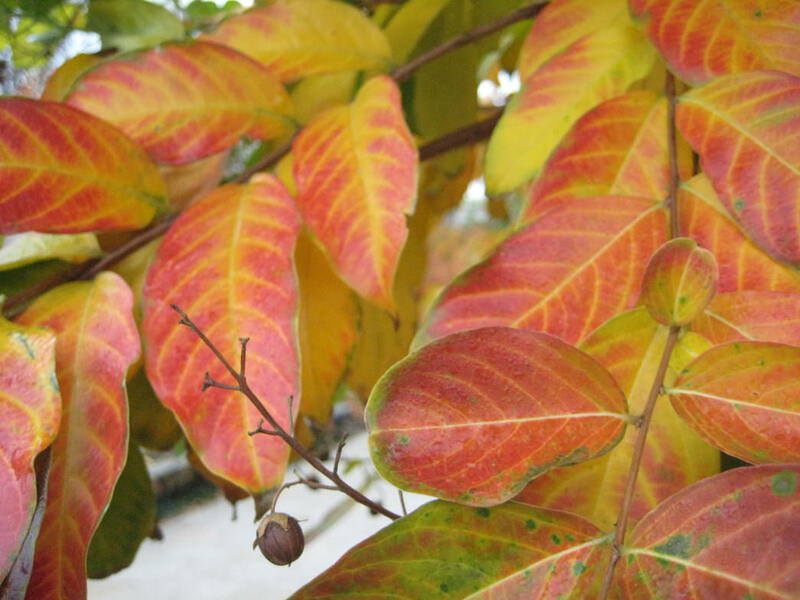 To prepare for this year’s fantastic foliage, RootsRated spoke with top arborist Greg Paige. As the arboretum curator at Bartlett Tree Research Laboratories, Paige helps individuals and groups improve the way they plant and care for trees all over the world. And as a local hiker and trail runner, Greg has firsthand experience on what it means to explore the fall colors in the Carolinas. When should we expect to start seeing a color change in our area? At higher elevations, like Mt. Mitchell at over 6,000 feet, those pigments will be triggered first. The charts say Mt. Mitchell will be peak the first week of October. I think they’ll be pretty close to that. I was up there a week ago and you can just start to see that glow. In Charlotte that last week of October to the first week of November is going to be peak for us. 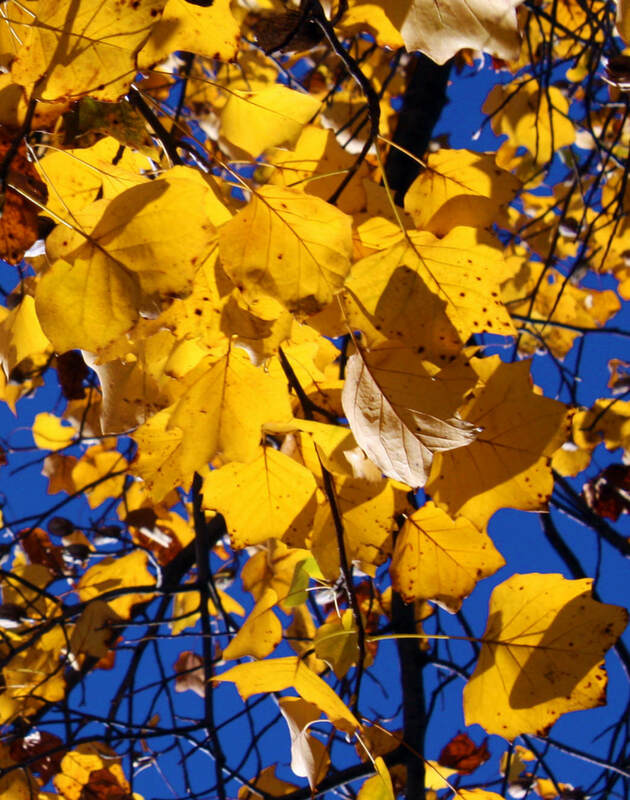 Will you explain the science behind fall color? Chlorophyll is the pigment in leaves that make them green. Shorter days and cooler temperatures tell the trees to stop making chlorophyll. Other chemicals that are dominant in the leaves (carotenoids for yellows and oranges and anthocyanin for reds) become more prominent. Tannins aren’t really a pigment, but they’ll make some of the browns in oak trees come out. What are some of the predominant trees we can expect to provide the most brilliant colors in the Carolinas? 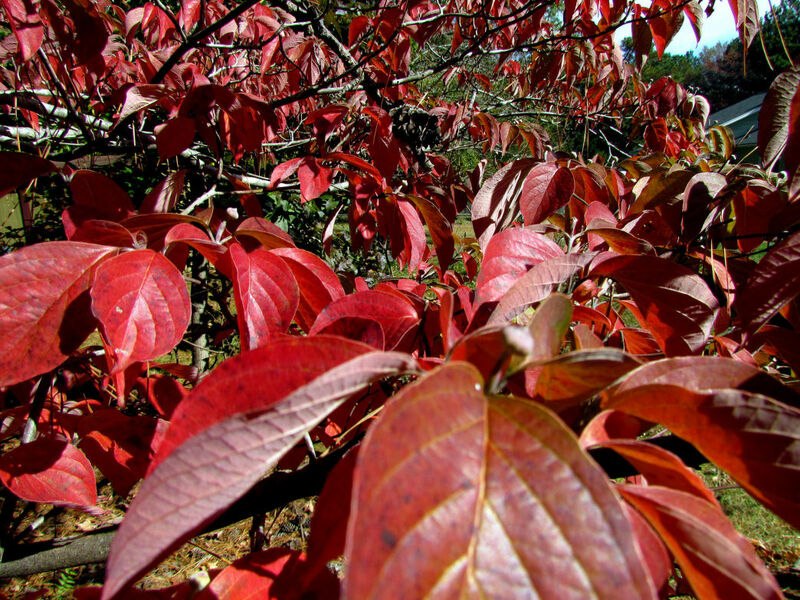 Dogwoods are a big fall color tree. They’re primarily red, burgundy, with a little orange. When it gets cooler it triggers the production of fruit, which turns a really bright red. Red Maple is another pretty dominant Carolina fall color tree. Although a few of these actually turn yellow, most that you’d see driving in North Carolina would turn red. The crepe myrtle aren’t native to Carolina so you won’t see many in the mountains but you’ll see them in people’s landscapes. This will turn a bright orange and yellow, one of the prettiest, I think, in the fall. Not a native to North Carolina, the crepe Myrtle is a popular landscape tree with beautiful color. Selena N.B.H. Other really good trees for color in our neck of the woods is the whole host of oaks that grow here. Post Oaks produce really nice burgundy color. Oaks are usually in the red spectrum, reds and oranges. But they can fade to brown because of the tannins in the leaves. Two other trees you’ll see throughout the piedmont are the tulip poplars and yellow poplars. They’re in the same family as magnolia and they show a really nice yellow. I really like that yellow fall color. 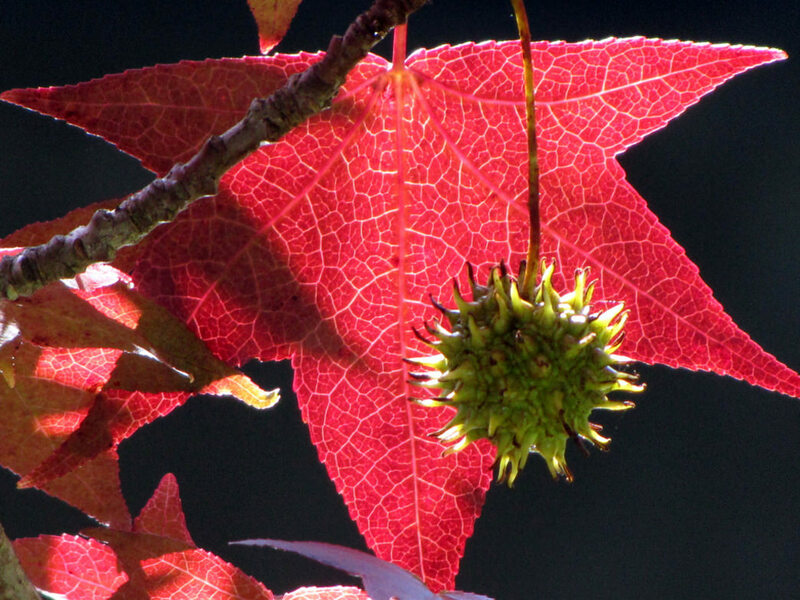 Sweetgums are known for really good fall color: Yellows, reds, and oranges all at the same time. Black gums have really pretty red fall color. The highest elevation hikes in western North Carolina are best in early fall. For central Carolina, mid to late fall is show time. Nature is fickle and scoffs at official predictions, but here are a few hikes to put on your fall list and a best guess at the optimal times to go. Doughton Recreation Area, Oct 14 to 21: Shaped roughly like a T-bone steak, the trails at Doughton form a large outer loop with a couple options bisecting it in the middle. The widest portion of the loop, its north and western edges, are also its highest at around 3,800 feet. The quick loss in elevation, about 2000 feet, creates a dramatic view of the ravine and mountains beyond. For a 12-ish mile loop, begin at the parking lot at Grassy Gap road (the lot is on the opposite side of the road as the park entrance). 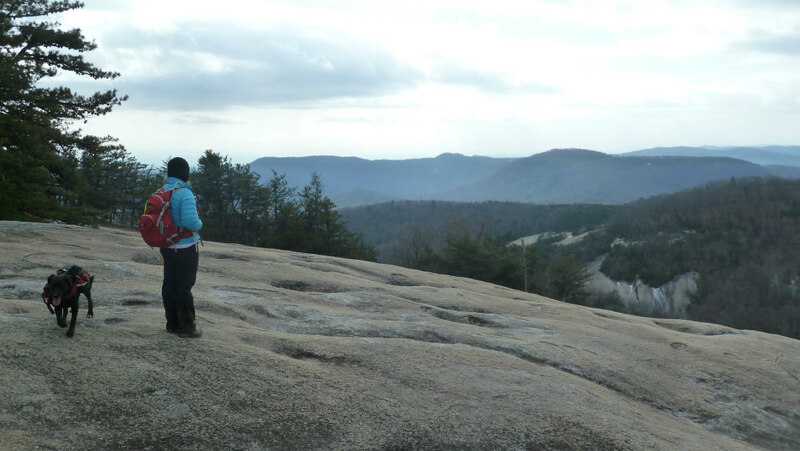 Hike up–way up–the Blue Ridge Primitive Trail, take a left, and return via the Bluff Mountain and Flat Rock Ridge trails. Stone Mountain State Park, Oct 21: With an elevation about a thousand feet lower than Doughton but sitting right next door, the leaf peak for Stone should be around a week later. With wide-open views from the top of an expansive granite peak, Stone Mountain is among the best spots for finding fall foliage. Begin at the Lower Trailhead parking lot near the back of the park. The 4.5-mile Stone Mountain Loop trail includes the best parts of the park. A steep climb to the top of Stone Mountain is rewarded with some of the grandest views this side of Asheville and the subsequent drop back down passes by a large waterfall. It’s easy to add a few other trails for additional mileage. 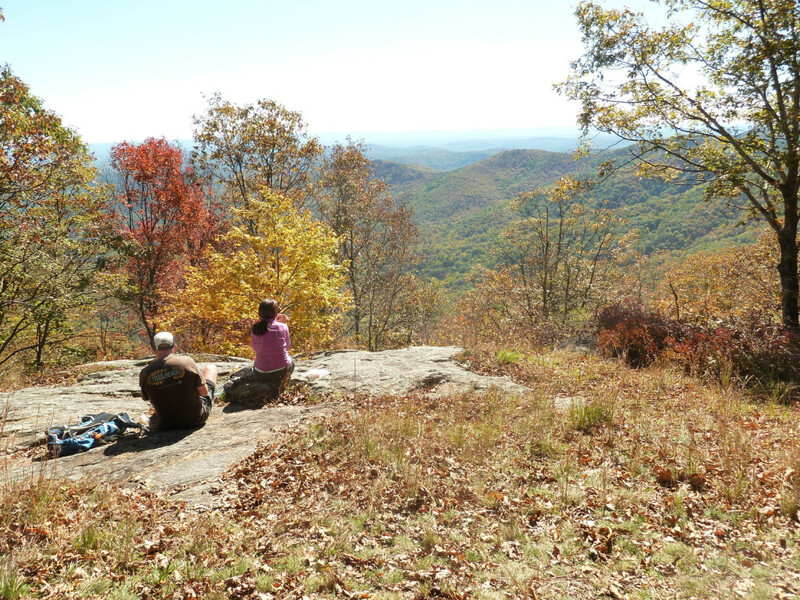 Crowders Mountain, Oct 28: Like an old friend, Crowders Mountain State Park is the familiar stomping grounds of Charlotteans looking for a local outdoors fix. The 1,385-foot mountain (more formally a monadnock) rises 800 feet from the surrounding countryside. The lower elevation of Crowders means the peak leaf show is happening while other, higher mountains have lost most of their color. And the stark elevation change provides the best view this close to uptown. One of the most popular ways to reach the top of Crowders Mountain is a 5-mile loop that begins at the main visitor center—officially called the Sparrow Springs Access. The trailhead is to the left of the visitor center. When the path first splits, just a short distance from the TH, take a right on the Crowders Trail. Once you cross the road you’ll have a choice of continuing on the Crowders Trail or turning right on the Rocktop Trail. Either will get you to the peak with the Rocktop option being a bit more rugged at times. Latta Plantation and Nature Preserve, early November: Without any version of a mountain to call its own, fall comes last to Latta . 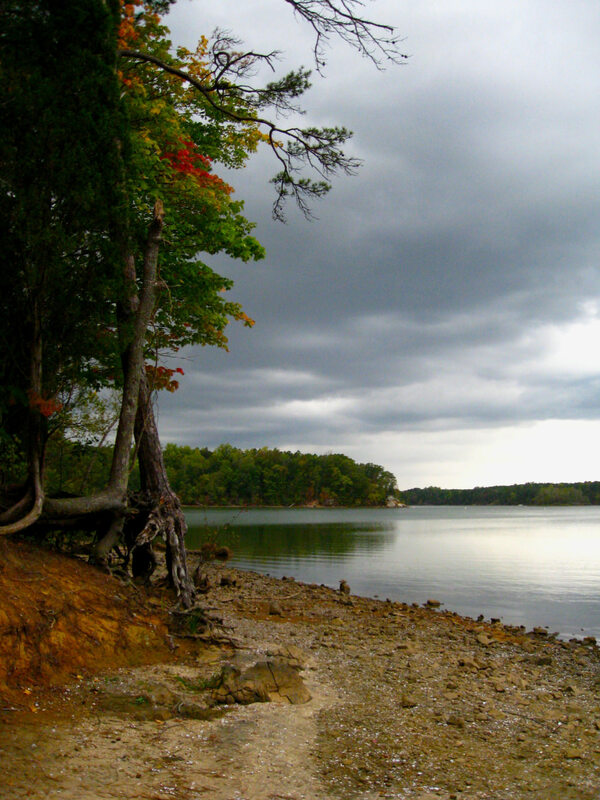 While there are no towering views, hiking the trails that lace the Mountain Island lake peninsula is an opportunity grab that last show of color from deep within the forest. Even with a map the trails at Latta can be difficult to follow—13 trails make up the 16 miles at that park. For your first visit plan a little extra time to get lost. A good strategy for your first visit is to park at the Nature Center (the first lot on the left) and walk up the Hill Trail. Meander through the web of trails that connect to it in the northern part of Latta. Even if you get a bit turned around, you’ll eventually connect back to the Hill Trail for your triumphant trek back.